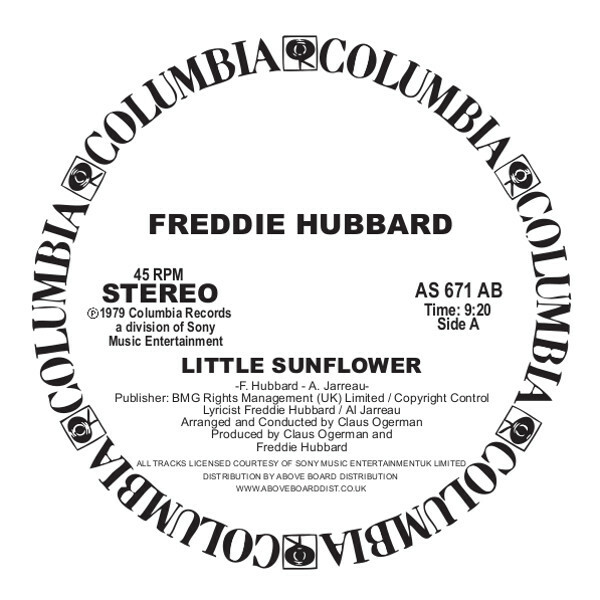 Lifted from Hubbard's lauded 1979 LP 'The Love Connection', this sublime piece of melodic, deep, Soul / Jazz will have ears and minds open with it's instantly recognisable opening string sequence. Used to devastating effect on Pepe Bradock's all-time 1999 deep-House classic 'Deep Burnt', those sweeping strings capture us and lead us into a epic journey with the wondrous vocal stylings of the legendary singer Al Jarreau. This is prime early morning music, pushing all the right buttons and spreading light wherever it is played, a beautiful beautiful record indeed. What is essentially an extended and rearranged version of Hubbard's 1967 original, the '79 version of 'Little Sunflower' boasts a sumptuous arrangement and production from the mighty Claus Ogerman (Ben E King, Mel Torme, Bill Evans, Antonio Carlos Jobim & more). A truly wondrous piece of music, reissued on a single side in it's full 12" length of 9+ minutes from the source archive audio. Fully legit, licensed and reissued with love by Above Board distribution and Columbia Records / Sony BMG for Record Store Day, 2019.